The really big news, however, can be found beneath the framerails, where an all-new independent A-arm front/four-link rear suspension system utilizes Lexus-exclusive computer-managed hydraulics to lift and lower the vehicle as much as 3 inches on demand…and to re-tune spring rates and shock damping on the fly…The new system is said to reduce body lean by as much as 30 percent at road speeds via diagonally linked shock chambers…the new suspension struck us as far more responsive, and much quicker to react, to undulating terrain at trail speeds than the older (and still quite good) electromechanical Kinetic Dynamic system it replaces. Despite our best efforts to cross up the new LX on some steep and deep-rutted two-tracks, it was much more difficult for us to lift a tire off the ground than we would’ve guessed for a vehicle of this type. 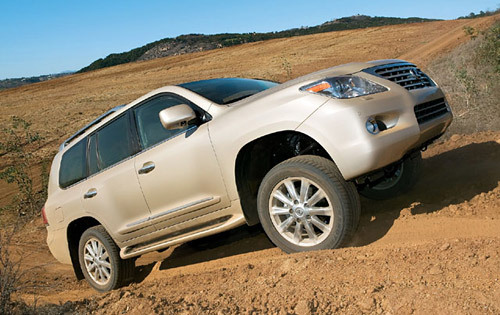 As with the Land Cruiser, the Crawl Control ultra-low speed-holding system is loud and rattly, and it’ll shake the seat of your pants (but thankfully not the well-isolated steering). It also, however, indisputably works, so just think of it as the automotive equivalent of one of those Magic Finger thingies you used to find in many of America’s finest motels, and enjoy the occasional lower-back massage while you’re crawling.